Click here to see what past players have said about South Bay Escape Room: Mortuary Mystery! Click here to see available dates and times. The basement of our historic, Old Torrance building – a real former mortuary – is the setting for this first-of-its-kind South Bay fundraiser, mixing together local history with spooky, fictional fun! You have 60 minutes to solve the puzzles and find the final clue to escape the room… but can you??? Questions? Email events@volcenter.org or call (310) 212-5009! Sign up for email updates about South Bay Escape Room | Learn why it's a perfect team-building activity! All participants must be able to climb up and down stairs, be up for a rush of adrenaline, and be willing to sign a waiver. There are no other special skills or knowledge required – this is a chance to put your curiosity and creativity to the test. Not familiar with Escape Rooms? Learn more below. 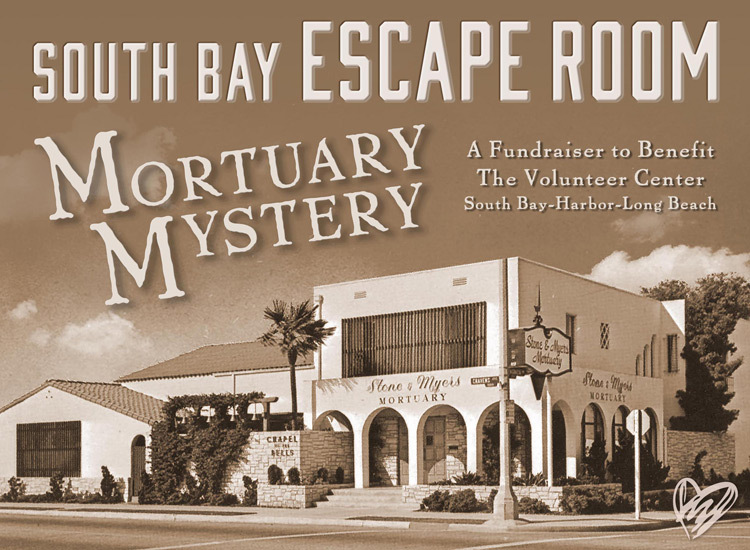 South Bay Escape Room: Mortuary Mystery benefits the Volunteer Center’s programs and services. "They've done a fantastic job putting together an escape experience that's on par with many of the rooms in the LA area. Add in that you're helping out a great cause and you've got a night out that can't be beat." "This one was more challenging, but not impossible! The puzzles were creative and clever and it sets you up to work together as a team. Super fun!" "If you are looking for a good room to test your skills, look no further! This escape room is good for both beginner and experienced escapers. The puzzles are well thought out, good clean environment and it's located in a good area... go treat yourself and see if you have what it takes!" "This was a really fun experience and a hidden gem! I highly recommend this to anyone looking for a fun activity around the area :) "
"This was a great room! Having done over 40 escape rooms, my husband and I have seen a lot of different rooms. We love immersive rooms and the fact that this room was located in a former mortuary made the experience feel immersive. The puzzles were challenging and different which is always refreshing for escape room enthusiasts. Highly recommend it! " "This was an amazing escape room. We've done a lot in the OC and LA area (over 40) and this one was one of the better ones. There were things we never saw in other rooms - a really cool and thought out room." "This was my first escape room and I had a blast! The puzzles were incredibly clever and well thought out. It was definitely mentally challenging and I couldn't have made it out on my own! Good thing we had 6 people in our group! Great for team building as we all were able to work together and contribute. It was a great feeling when the "lightbulb" turned on when we solved a puzzle piece that brought us closer to escaping!" "I'll be honest, I wasn't expecting much for an escape room because it's a pop-up for a Volunteer Center. But as my wife can attest to it, this wasn't the first time I was wrong. And I'm sure glad I was. Just in case you didn't know, this is a Volunteer Center, but it used to be a real mortuary. So there IS a creepy factor. I've done about a hundred rooms so far, and my team has done about 50-70 rooms, and we actually got stuck a few times. Our 2 hostesses were very kind and we managed to get out with only a few seconds on our clock. I thought I was a goner. But definitely do this room is you're looking for a challenge!" "This was such a fun escape room! My group and I have done about 20 escape rooms before this and this was among the more difficult. It's very logical though. The staff was very nice and were rooting for us. After we escaped, they came out and congratulated us and were very excited. This was one of the most exciting escape rooms I've experienced and I definitely recommend it." Click here to see more of our 5 star reviews on Yelp! 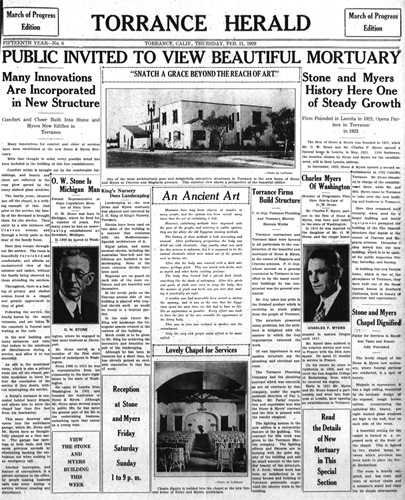 The Stone and Myers Mortuary opened on Cravens Avenue in Torrance with great fanfare the weekend of February 29, 1929, and the entire front page of the Torrance Herald’s "March of Progress" edition was devoted to it. The local paper called the new building "one of the showplaces of Torrance," declaring that Stone and Myers had built "one of the finest funeral homes in Southern California." Now, 88 years later, we've discovered a narrow staircase leading to an abandoned part of the basement full of old relics, and we need "volunteers" to help us solve the mortuary mystery before the one-hour volunteer shift ends. Not familiar with Escape Rooms? "Escape the room" games have become very popular over the last several years, both across the country and around the world. 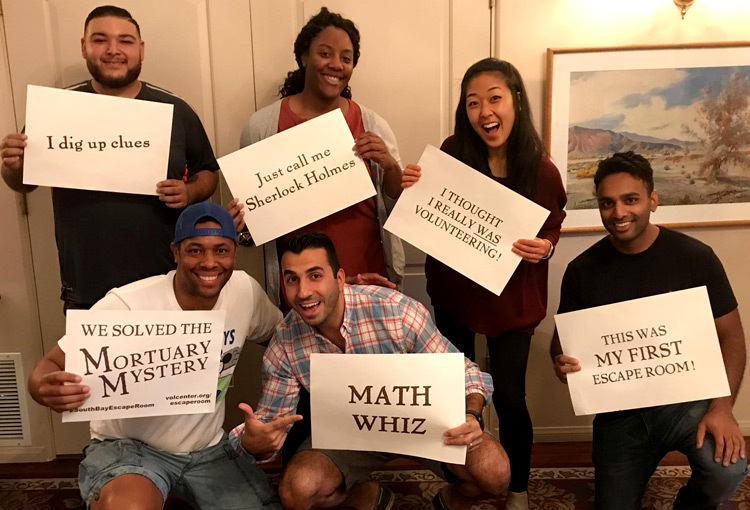 Teams are usually given one hour to solve a series of puzzles using strategically-placed clues, and they must use communication and strategy to figure out how to "escape" – a perfect activity for team-building! Each Escape Room is created around a specific theme and time period, such as a medieval dungeon, futuristic space station or present-day prison cell. Since the Volunteer Center’s Torrance building was originally a real working mortuary, we knew it was the perfect setting for our South Bay Escape Room fundraiser. Escape Rooms are also a fun way to bond as a group of friends, family or team, and don’t worry... even though you are "locked" in the room, you can ask to leave at any time. However, most people get so caught up in solving the puzzles that the 60 minutes flies by! Can you beat the clock??? Have more questions? Click here for our FAQ.